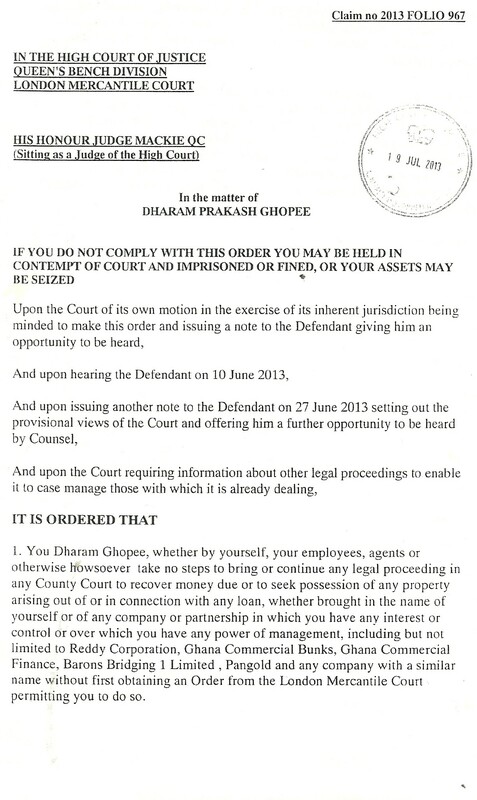 We have previously had cause to examine the activities of Mr Dharam Prakash Ghopee, via an assortment of companies, in lending money without a consumer credit licence, at astronomical rates of interest, then seeking possession orders and eviction of the borrowers’ homes. As we have previously noted, Mr Ghopee’s original vehicle for making these loans, Barons Finance Limited, is in liquidation following his failure to pay costs on a lost claim. There are plenty of other companies that Mr Ghopee uses, some of which are here, and to that list we can add ‘Euro Business Finance Plc’. Mr Ghopee apparently transferred the loan book of Barons Finance to, amongst others, Barons Bridging Finance 1 Ltd, though there are significant questions about the timing of that transfer. There have been substantial and complex proceedings in the Mercantile Court. HHJ Mackie QC appears to have reserved all ‘Ghopee’ cases to himself and there are a swathe of cases where permission has been granted for out of time appeal and set aside of possession orders, and, the last I heard, another set of joined cases where permission to appeal out of time was being sought. There have been few published judgments or decisions in these cases. I have heard about various hearings and application hearings, and have seen some notices and orders, but only piecemeal, relating to specific cases under the umbrella of ‘the Ghopee matters’ and in a way that has made it very hard to reconstruct the course of the proceedings. However, I have no received what appears to be a scan of an order made back in July 2013. A copy is below (and can be downloaded here). Disclaimer. I have not been able to independently verify this document. I am putting it up here on the basis that everything about it is consistent with orders I have seen from the Mercantile Court proceedings. It may be that the order, if such it is, was set aside or varied and I have not seen the subsequent order. If this is indeed an order made in the Mercantile Court proceedings by HHJ Mackie QC, then everyone involved in proceedings with one of Mr Ghopee’s companies in the County Court should take note and seek to verify the current state of play with the Mercantile Court. 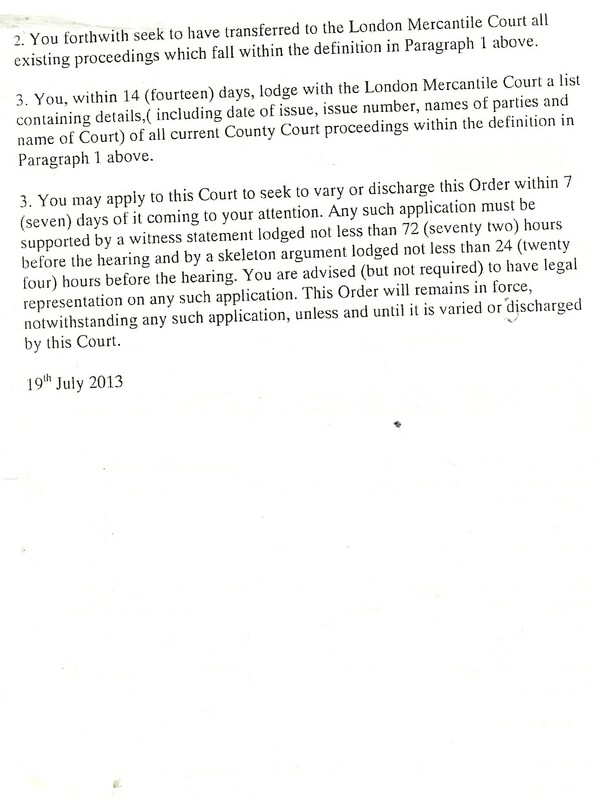 Any County Court Judiciary sitting on matters involving Mr Ghopee might also wish to seek clarification. A list of companies known to have Mr Ghopee as director or for which he has been acting follows the order. It is also worth noting that Halifax Repossessions and Halifax Business Finance had registered offices in the Southend area, one as PO Box 5467, Southend-on-Sea, SS0 9GY, the other as Gopee Business Centre, 9 St Vincent’s Road, Westcliff-on-Sea, Essex, SS0 7BP. In various forms of ‘Credit Agreement’, the address of both Ghana Bunks and Barons Finance Limited has been given as ‘PO Box 5467, Southend-on-Sea, SS0 9GY’, though neither was registered there. It appears that as well as 169 Perry Vale SE23 2JD (And 169A Perry Vale), the Southend addresses also get used by Mr Gopee’s companies’ ‘credit agreement’ documents, though these are not the registered addresses (e.g for Reddy Corporation and Ghana Bunks). Posted in Housing law - All, Mortgage possession. Many of Mr G’s possession claims go through Bromley County Court. The judges and the duty desk are well aware of the various names used. Mainly though, the guy works out of Southend. I have had conversations with my opposite numbers there who are equally well aware. Yes, but this order – assuming it is genuine – brings any possession claims to a grinding halt unless there is permission from HHJ Mackie QC. Can someone who has a loan charged on their house barons finance have the order removed as the company has been in liquidation and the repossession order was suspended on the same house since 2012. That needs detailed advice and is not something we can answer here. I know there has been a very recent hearing on Gopee’s companies in liquidation which may have addressed this issue, but have not heard more. does anyone know the out come of this case ? and how I can get a charge put by Mr Ghoppee on my property removed. And I think you would have to deal with the administrators for the company involved.